In today's world, fuel prices are increasing day by day. Diminishing supply and spiraling demand for the fuel is resulting into higher prices of fuels. So, it is essential to seek for various methods to save fuel. Obviously one needs to choose a cost effective fuel to meet needs. We should be thankful to Rudolph Diesel for his invention of diesel engine. Due to his invention, many car and truck drivers are enjoying the benefits of extremely efficient and cost effective engines. Diesel engines are commonly utilized as power generators and mechanical engines. They contribute well in mobile drives as well. In addition to this, this highly efficient engines find its wide spread use in countless industrial applications, locomotives, automobiles and construction equipments. As compared to gasoline, diesel fuel is priced relatively higher; however, diesel has a higher energy density. In other words, more energy can be extracted from diesel than gasoline. So, diesel engines in trucks offer higher mileage. Diesel fuel is an apparent choice for heavy-duty equipments and transportation. Diesel is oilier as well as heavier as compared to gasoline. Further, it has a higher boiling point than water. In addition to this, diesel engines are highly effective and efficient. That is why diesel truck engines are gaining great popularity. To understand it correctly, it is essential to know how a Diesel Engine works. The distinction lies in the type of ignition. To ignite fuel, Gasoline ignition makes use of spark ignition whereas diesel engines operate on compression - ignition technique. In the diesel engines, air is drawn into the engine where it is subjected to high compression which heats it up. Due to this, engine attains a very high temperature which is very higher as compared the temperature obtained in a gasoline engine. Diesel enters in the engine at this peak temperature and pressure. In a gas engine a mixture of gas and air is introduced in the engine. On the other hand, in a diesel engine, fuel and air are infused in the engine at different stages. For injecting fuel, a separate injector is used in a diesel engine whereas a carburetor serves the purpose in gasoline engines. As fuel and air are infused into the engine together, and compressed afterwards, the fuel and air mixture restricts fuel compression. Thus, it lowers the overall efficiency. 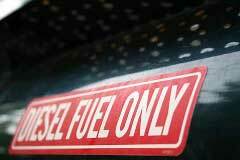 In a diesel engine, only air is compressed at comparatively higher ratio of 14:1 up to 25:1. The combustion by-products are eliminated from the engine by means of the exhaust after combustion. Modern diesel engines have defeated all drawbacks of former models with higher maintenance costs and noise. · Diesel engines are more reliable and rugged. · Fuel cost per Kilowatt generated is 30% - 50% lower as compared to gas engines. · As gas units burn hotter than diesel units, they have an extensively shorter life than diesel units. · Diesel engines offer easier maintenance, better fuel economy, and more torque. In terms of miles per gallon and performance for trucks, diesel engine is the leader over gas engines. · The cost for diesel is slightly cheaper than that of the gas these days. With gas costs on the rise nowadays, diesel will persist on to be preferred choice for years to come. It is clear that diesel engines are the best options for trucks. A well-maintained diesel truck engine will give the best performance in its long run. It will make you enjoy the great benefits in terms of performance and efficiency without making a big hole to your pocket. Get ready to enjoy great benefits of these diesel engines for your truck now!